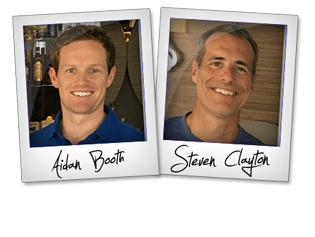 Aidan Booth + Steven Clayton – Parallel Profits Launch Affiliate Program JV Invite, More. Welcome to the JVNP 2.0 Update featuring a primary JV invite courtesy of fellow JVNP 2.0 Partners Aidan Booth + Steven Clayton (Parallel Profits launch high ticket affiliate program JV invite), Buzz Builders (Eben Pagan – Digital U, Bryan Winters – Zippo Pay launches), and More … in Today’s twisting your way to Parallel Profits edition. Hi, Fellow JVNP 2.0 Partner … Aidan Booth here, on behalf of Steven Clayton. 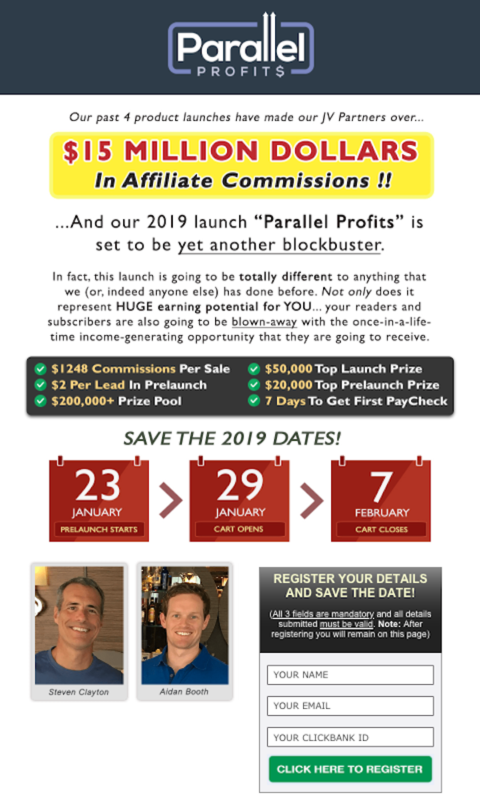 Get ready to cash-in with a $200,000 total prize pool, unlimited $2/lead pre-launch payouts and $1,248 commissions on our biggest and most profitable launch to date – Parallel Profits. Parallel Profits teaches a business model that is without doubt one of the fastest ways to generate a full time living working from home. In fact, you only need as little as 7 “sales” to create a $100,000 per year run-rate. The business model is selling simple services to local businesses but with three BIG twists that make this product (and launch) completely unique and different to anything ANYONE has done before. These three “twists” will remove almost all the usual roadblocks that people hit when trying to build a business, make the model highly scalable and subsequently will dramatically increase their chances of success. To find out the full details, head over to the JV page. #1. HUGE EARNING POTENTIAL: With $1248+/sale commissions (and your first paycheck coming within a few days of cart close), $200,000+ in prizes and $2/lead paid out in prelaunch, this launch could easily be your biggest earner of 2019. #2. PROVEN TRACK RECORD: In the past four years alone, our online training programs have generated over $35MM in product sales, paying out over $15MM in affiliate commissions. In fact, we have been running multi-million dollar launches every year since 2008 and know exactly how to structure a launch to generate the maximum number of sales for YOU. #3. QUALITY PRODUCT: Parallel Profits will massively over-deliver. This training has been in development for more than 10 months and will feature weekly live training, instructional videos, a software and services suite, unlimited support and more. If you’re an established, proven successful Affiliate Marketer, we’re looking forward to working with you! Please go here to sign up to the JV list to receive contest details and further updates and anything else you might need to REALLY make a lot of money promoting Parallel Profits. Get On Board What Just May Be Russell Brunson’s Best InfoProduct Launch, Yet! The 10x Secrets Masterclass will unpack the principles, process, scripts, and psychology that Russell Brunson used to sell over $3Million in 90 minutes on Grant Cardone’s 10x stage last February. It’s a practical, done-for-you blueprint for any driven business owner who wants to sell to the masses. Join the ClickFunnels Affiliate Program to receive 10x Secrets Masterclass JV details as they are made available => Russell Brunson – 10x Secrets Masterclass affiliate registration. Grab $99.40+ Per Sale Promoting Brian Tracy’s Top Converting Offer! The 6 Figure Speaker, Brian Tracy’s top converting affiliate promotion, is designed for those who want to learn, develop or improve the skillset required to speak confidently and effectively in front of an audience, whether it is in person, on camera or from the stage. Experienced Affiliate Marketers, start earning $99.40+ per sale in affiliate commission (partners are earning up to $1.70 EPC). Brian Tracy – 6 Figure Speaker affiliate program registration_page. Emmanuel Akinwale (Morbic Athletes), John Di Lemme, and other fellow JVNotifyPro 2.0 partners are waiting in the wings … keep your eyes on your Inbox, and follow the action in the JVNP 2.0 Premium VIP JV Announcement archives. Posted in High Ticket Product Launches + Affiliate Programs, Internet Business + Marketing, Joint Venture Announcements	| Tagged Affiliate Marketing, Affiliate Programs, Aidan Booth, Bryan Winters, Buzz Builders, Digital U, Eben Pagan, evergreen affiliate programs, Find Affiliates, Find JV Partners, high ticket affiliate program, High Ticket Launch, Home Business, Internet Marketing, Joint Ventures, JV Calendars, JV Invite, JVNewsWatch, JVNotifyPro, Launch Calendars, Launches, Make Money Online, Marketing, Mike Merz, Need Affiliates, Need JV Partners, New Product Launches, Niche Marketing, Online Business, Parallel Profits, Steven Clayton, Work At Home, Zippo Pay	| Comments Off on Aidan Booth + Steven Clayton – Parallel Profits Launch Affiliate Program JV Invite, More.